The application server domain is undersized for the load. Increasing the number of application server domains or application server process may be appropriate. However, before increasing the number of server process it is necessary to ensure that the physical server has sufficient memory and CPU to support the domain (if the application server CPU is overloaded then requests move from the Tuxedo queues to the operating system run queue). The application server has too many server processes per queue causing contention in the systems calls that enqueue and dequeue requests to and from IPC queue structure. A queue with more than 8-10 application server processes can exhibit this contention. There will be a queue of inbound requests, but not all the server processes will be non-idle. When user service requests spend time queuing in the application server, that time is part of the users' response time. 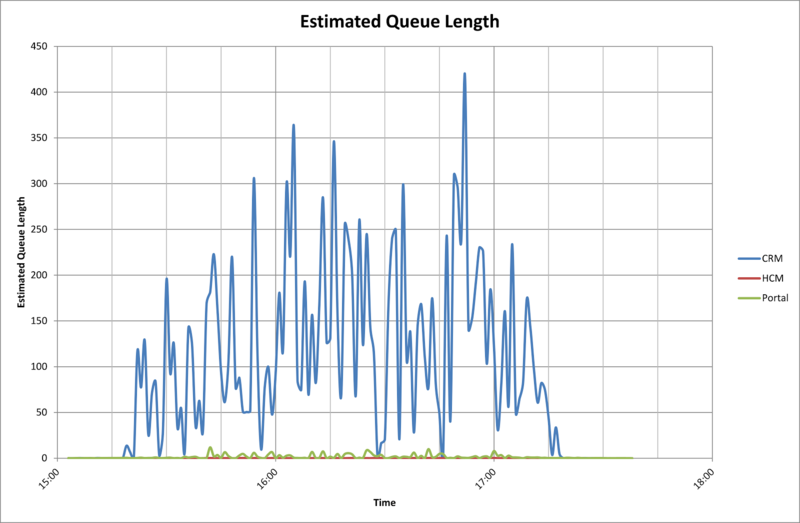 Application server queuing is generally to be avoided (although it may be the least worst alternative). What you do about queuing depends on the circumstances, but it is something that you do want to know about. Direct measurement of the Tuxedo domain using the tmadmin command-line interface. A long time ago I wrote a shell script tuxmon.sh. It periodically runs the printqueue and printserver commands on an application server and extracts comma separated data to a flat that can then be loaded into a database. It would have to be configured for each domain in a system. 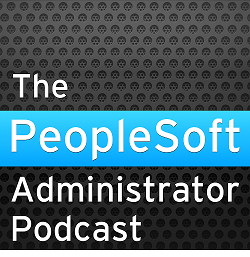 Direct Measurement with PeopleSoft Performance Monitor (PPM). Events 301 and 302 simulate the printqueue and printserver commands. However, event 301 only works from PT8.54 (and at the time of writing I am working on a PT8.53 system). Even then, the measurements would only be taken once per event cycle, which defaults to every 5 minutes. I wouldn't recommend increasing the sample frequency, so this will only ever be quite a coarse measurement. Indirect Measurement from sampled PPM transactions. Although includes time spent on the return queue and to unpack the Tuxedo message. This technique is what the rest of this article is about. Transmit the message across the network from the web server to the JSH. There is a persistent TCP socket connection. To enqueue the message on the APPQ queue (including writing the message to disk if it cannot fit on the queue). To dequeue the message from the queue (including reading the message back from disk it was written there). I am going make an assumption that the majority of the time is spent by message waiting in the inbound queue and that time spent on the other activities is negligible. This is not strictly true, but is good enough for practical purposes. Any error means that I will tend to overestimate queuing. Some simple arithmetic can convert this duration into an average queue length. A queue length of n means that n requests are waiting in the queue. Each second there are n seconds of queue time. So the number of seconds per second of queue time is the same as the queue length. I can take all the sampled transactions in a given time period and aggregate the time spent between transactions 115 and 400. I must multiply it by the sampling ratio, and then divide it by the duration of the time period for which I am aggregating it. That gives me the average queue length for that period. This query aggregates queue time across all application server domains in each system. It would be easy to examine a specific application server, web server or time period. Transactions are aggregated per minute, so the queue time is divided by 60 at the end of the calculation because we are measuring time in seconds. Is this calculation and assumption reasonable? The best way to validate this approach would be to measure queuing directly using tmadmin. I could also try this on a PT8.54 system where event 301 will report the queuing. This will have to wait for a future opportunity. However, I can compare queuing with the number of busy application servers at reported by PPM event 302 for the CRM database. Around 16:28 queuing all but disappears. 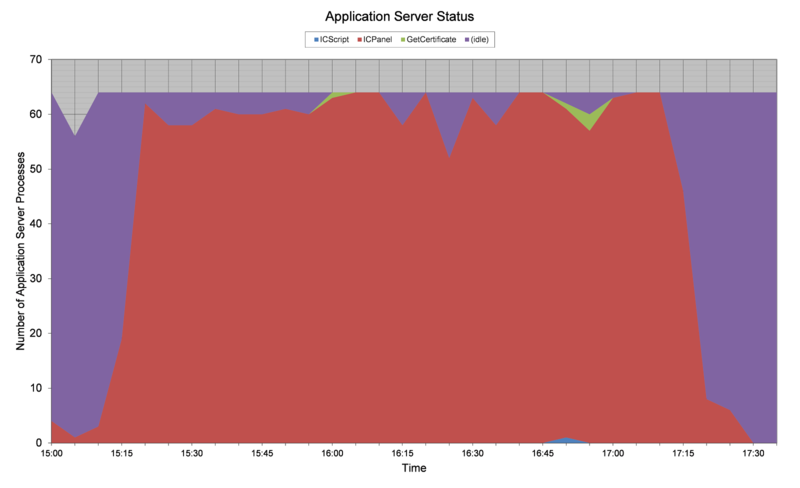 We can see that there were a few idle application servers which is consistent with the queue being cleared. Later the queuing comes back, and most of the application servers are busy again. So it looks reasonable. Is there a trace flag or a populating event to trigger such that the referenced PSPM tables are populated in PT8.51? You have to set PeopleSoft Performance Monitor up so that it is collecting transaction data at standard filter level. There is a whole PeopleBook dedicated to PPM. The data will go to the monitoring system, not the monitored system. There are also a number of presentations on my website 'www.go-faster.co.uk', and some other postings on this blog that deal with optimising PPM.